Loop Inverters can be incorporated into existing conveyor lines, and take bottles through a 360-degree loop to assist with the removal of any debris or foreign objects. They are a necessity where there is a potential for flash to fall into bottles during production. Each machine can be manufactured to individual customer requirements. All our loop inverters are supplied with automatic chain tensioners, which protect the machine against potential chain snags and breakages, caused by the natural expansion or wear and tear of the chain and offer speeds capable of handling virtually all single-track conveyor lines. We can also offer the option of a 30 Degree Inverter for specialised handling. What are loop inverters used for? Loop inverters are primarily used to change the orientation of products for specific periods of time, ejecting debris in them before they are filled. Many clients from the dairy sector have purchased loop inverters. These inverters are comparable to side grippers and elevators, using gripper chains to hold products. Several companies from the beverage industry have also benefited from these systems. We have produced systems to turn bottles upside down, coating the bottom side of caps so they can be sterilised as part of the hot filling process. Air rinse facilities are also regularly used with loop inverters. An inverter can take hold of a bottle before turning it upside down to spray air inside its base, removing debris before the bottle is returned to its original orientation so that it can be filled safely. We were recently enlisted by a well-known manufacturer of crisps and snacks to design and manufacture a system with an air rinse facility to remove debris from their containers. This machine accepts containers in a single file line and uses side gripping conveyors to move them through 360 degrees. Whilst the containers are upside down, blow nozzles send filtered air through them. 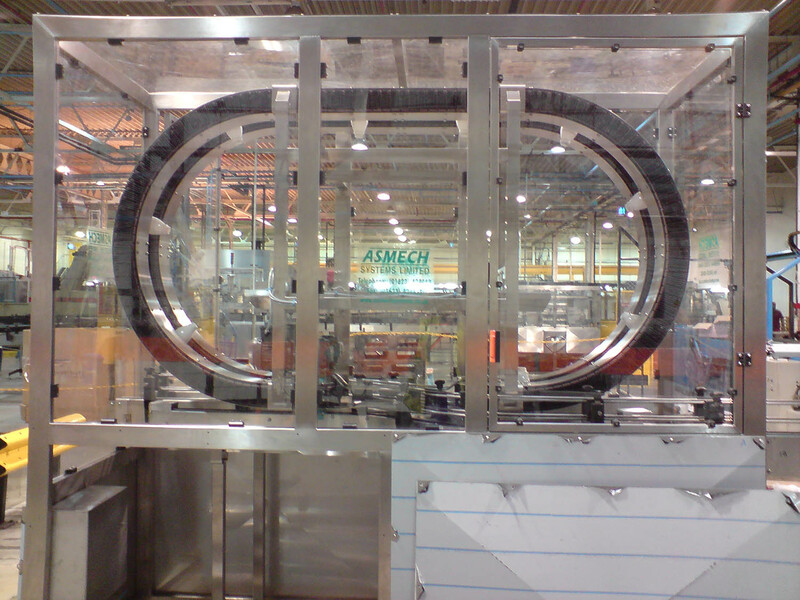 At Asmech, we offer a wide range of loop inverter systems to meet a host of requirements. We offer low-maintenance solutions but can come to your assistance if your solution ever does require attention. We can manufacture loop inverter systems directly towards your requirements in order to address specific needs and have produced them for companies from a wide range of industries. You are welcome to contact us at any point if you have any queries about how loop inverters can boost the efficiency and productivity of your business. Asmech is one of the UK’s leading designers and producers of loop inverter systems and can assist with bespoke design, installation and commissioning. We can also work with all kinds of footprints and belt paths. Why not get in touch today to find out more about our bespoke loop inverters? You can reach us by calling 01623 424 442 or by sending an e-mail to sales@asmechsystems.co.uk. Alternatively, you can use the contact form on our site to request a callback and we will provide a prompt response.